Cochin is the oldest European settlement in India, the history of European involvement in Cochin from the early 1500s onward is dominated by aggression of Portuguese, Dutch and British who successively competed to control the port and its lucrative spice trade. Layered impressions - Chinese, Arab, Jewish, are contained within its environment. Giant Chinese fishing nets that billow from massive teak and bamboo poles dot the entrance to the harbour. Silhouetted against the setting sun, they present a magnificent sight at the waterfront. Kochi is arguably the ideal starting point for exploring the unfathomable diversity and beauty of Kerala, rated in the top three tourist destinations by the World Travel & Tourism Council and featured in National Geographic Traveler's '50 greatest places of a lifetime'. 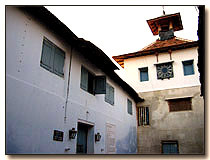 Mattancherry Palace : Also known as Dutch Palace. Built by Portuguese and handed over to Cochin Raja in 1555 AD and the was renamed as Mattancheri Palace in 1663, when the Dutch spruced up the palace. 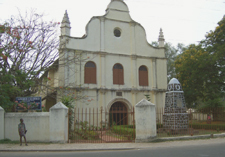 However, neither the Portuguese nor the Dutch stayed in the palace.The centre of the building has a Coronation Hall where Cochin Rajas investitures were held. Today, it is a portrait gallery of the Rajas. Rooms adjacent display 17th century murals depicting scenes from the epic,Ramayana. Open for visitors. 10 am to 5 pm Closed on Fridays, national holidays. 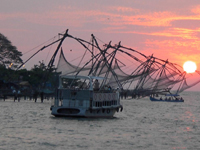 Chinese Fishing nets: The huge, elegant Chinese fishing nets lining the northern shore of Fort cochin add grace to water front view and has a photographic image of Kerala. you can buy fresh fish from the tiny market here and have it grilled with seasalt, garlic and lemon at one of the stalls nearby.